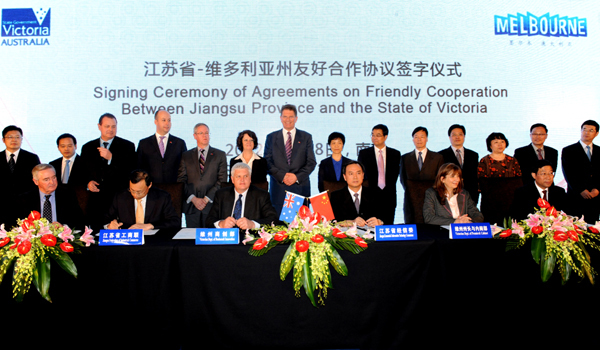 Premiere Denis Napthine officially signed the minutes of the meeting after attending yesterday’s coming together of the Victoria-Jiangsu Joint Economic Committee (VJJEC) in Melbourne, celebrating Victoria’s 35-year Sister-State relationship with Jiangsu. “The Victoria-Jiangsu Joint Economic Committee is the foundation of our economic relationship, reaffirming economic ties and securing links in higher education, government and private industry through exchanges, agreements and expos,” Dr Napthine said. According to the media release, the minutes of the VJJEC meeting commit Victoria and Jiangsu to focus on key areas — which includes culture, education, food and agriculture, information communication technology and biotechnology, sustainable urban design, tourism and transnational e-commerce — for collaboration over the next two years. supporting deeper cooperation between state cultural institutions and other cultural exchanges through an agreement between Jiangsu Provincial Cultural Department and Arts Victoria. The meeting has recognised productive partnerships between Victoria and Jiangsu since 2012, which includes high level diplomatic visits; economic cooperation such as the commencement of the Victoria-Jiangsu Business Placement program; the Jiangsu-Victoria ICT seminar event; new sustainable urban design projects; and education and training partnerships such as the official opening of the Southeast University-Monash University Joint Graduate School in Suzhou and the Hamer Scholarship program. The meeting was attended by the Vice Governor of Jiangsu Province, Mr Shi Heping, who was accompanied by more than 60 senior government and business leaders making them one of the largest delegation to visit Victoria.